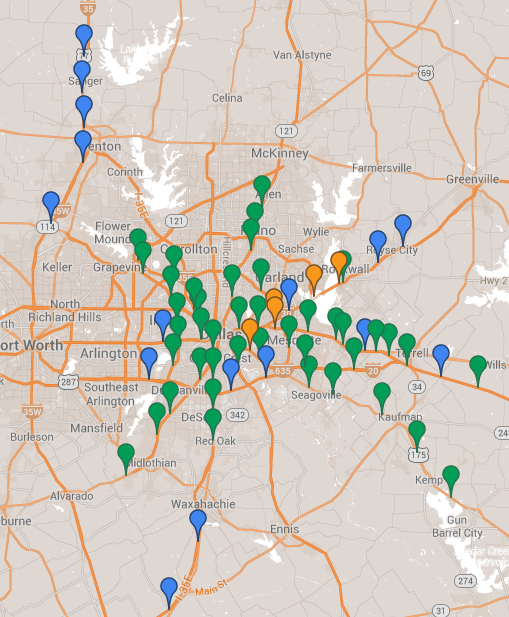 TxDOT Dallas District to keep speed trap speed limits? The Dallas County Sheriff’s Office recently made hay over massive noncompliance with freeway speed limits. Drivers aren’t the problem. The problem is almost all our freeway speed limits are speed traps: they are way too low. TxDOT recently proposed 5 mph speed limit increases on a few, outlying highways. This isn’t enough. 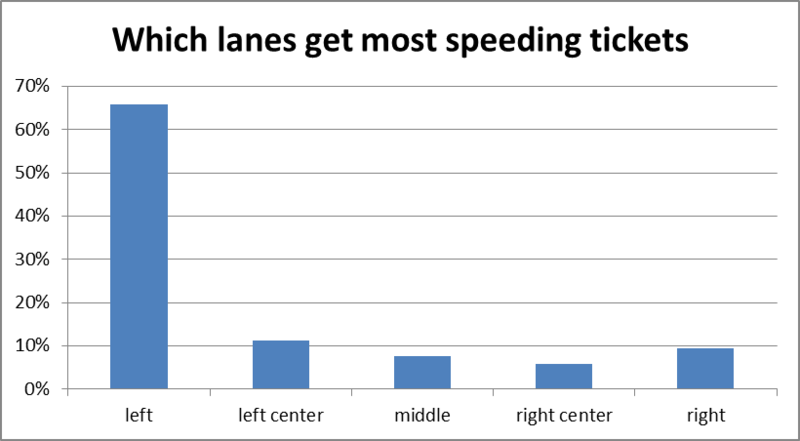 TxDOT did a lot of speed studies in 2012. 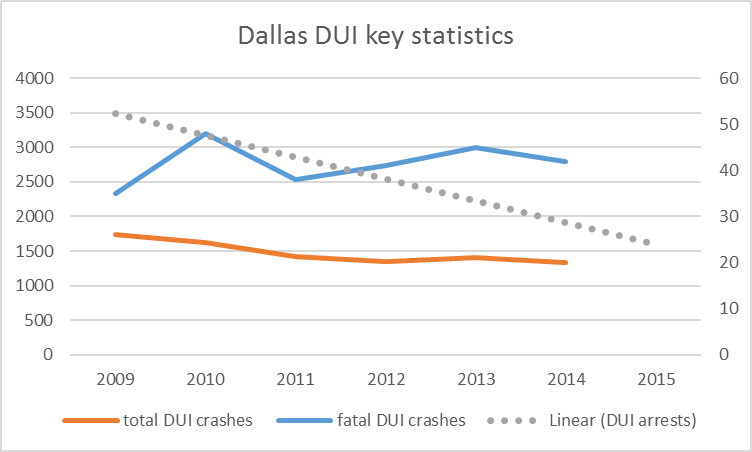 If TxDOT followed its own speed zoning procedure, then these studies require a 10 mph increase on almost all Dallas-area freeways, even inside the loop. All those 60 mph limits? Almost all should be 70 mph, some 75 mph! Here’s the current speed limits at all speed checks. Red is 60 mph, orange is 65 mph. Here’s what the speed limit should be, if TxDOT follows its own rules. Orange is 65 mph, green is 70 mph, and blue is 75 mph. 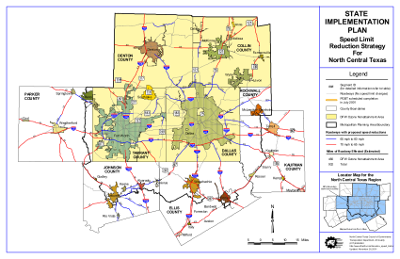 In the early 2000s, mendacious bureaucrats in the North Central Texas Council of Governments inflicted environmental speed limits on the Dallas/Ft. Worth area as part of a Clean Air Act compliance plan. Already too-low speed limits were made even lower : all area 70 and 65 mph limits within roughly 50 miles of downtown Dallas and Fort Worth were reduced by 5 mph. In the late 1990s, based on modeling done in EPA’s MOBILE5 software, it was believed that capping all area speed limits at 55 mph would get the area 1.5% closer to needed emissions reductions. Yes, that’s right, a whopping, practically unenforcable 10-15 mph speed limit reduction just buys us 1.5%. That was hugely unpopular in Houston and was replaced with a 5 mph reduction scheme, the same scheme that DFW got. So OK, this 5 mph reduction scheme may be more on the order of 0.5% of the emissions goal (assuming a linear relationship). Further, they found that almost all the emissions benefit was from heavy trucks, not cars. It gets better. Before the ESLs even went into effect, they reran the models using newer software, EPA MOBILE6. Well, lo and behold, the newer software found that, at best, the emissions reduction was so small, it was a rounding error! Even newer software, EPA MOVES, now finds that there is probably no emissions benefit of lowered speed limits. Despite all this, the EPA-approved smog reduction plan had ESLs baked into them, and NCTCOG bureaucrats lacked the spines to do anything about it until over a decade later! Only in 2013 did we start to get public reports of ESLs going away. To be clear: if ESLs go away, then TxDOT can freely raise speed limits on ESL roads. It doesn’t need to revert to the limit in effect before the ESLs. When the ESLs took effect, Texas law did not permit speed limits over 70 mph; since then, the law has been changed to allow up to 85 mph limits. Even then, there were many 65 mph limits that were themselves under-marked. Why is TxDOT proposing only a 5 mph speed limit increase? I don’t know, and it contradicts TxDOT’s own rules. TxDOT’s Procedures for Establishing Speed Zones require the speed limit be the 85th percentile speed rounded to the nearest 5 mph increment (reference). If the 85th percentile speed is, say, 73 mph, the speed limit must be 75 mph. You may ask, “What is the 85th percentile speed?” It’s the upper end of the “flow of traffic”. 85% of drivers’ speeds are at or under the 85th percentile speed. TxDOT’s manual allows some deviation from this, like higher than average crashes or roadway design factors. However, by definition, most roads will not have higher than average crashes, and freeways generally are built to the highest design standards, so these cannot be used to justify TxDOT’s failure to use the 85th percentile speeds. So what gives? I don’t know. This is only a guess, but I think TxDOT’s Dallas Office may no longer care about the serving the public, preferring to maintain speed trap speed limits. I say this for two reasons. First, the existence of ESLs don’t explain all our low speed limits. ESLs never applied to any roads within I-635 or I-20! ESLs only applied to roads that used to have 65 or 70 mph limits. That means that TxDOT has always been free to raise non-ESL road speed limits. I am sure that, for years, there has been a good case to raise almost every inner-loop freeway, which were not bound by ESLs, by at least 10 mph. Why has TxDOT not bothered to do it, and why does it still drag its feet? Second, TxDOT has previously shown active disregard for the motoring public. For example, in the late ’90s, Dallas District staff tried to impose arbitrary speed limits on Farm to Market roads that were 10-15 mph too low. While TxDOT’s Austin office rebuked them, the result was still a uniform speed limit that remained 5-10 mph too low. I want TxDOT to stop using arbitrary, speed trap speed limits. Making all of us play a reverse lottery doesn’t make roads safer, doesn’t clean the air, and benefits nobody. If TxDOT wants to serve the motoring public and is interested in following its own policy, it will raise almost every Dallas-area freeway speed limit to 70 or 75 mph. Posted on April 10, 2014 July 31, 2014 Categories Traffic SafetyLeave a comment on TxDOT Dallas District to keep speed trap speed limits? 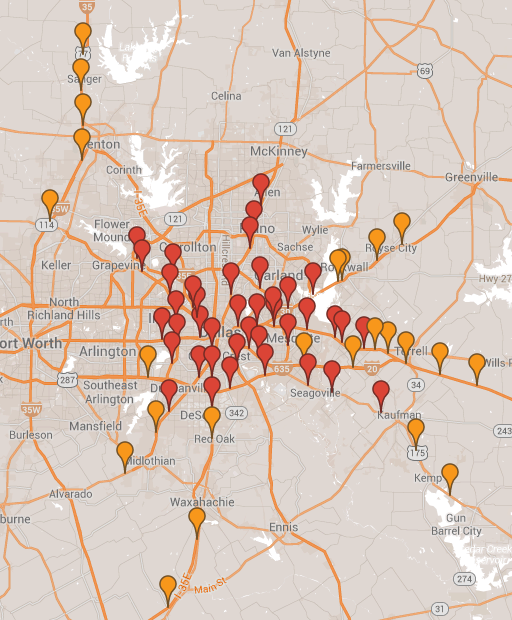 Dallas County Schools bus cameras = profiteering? My feathers got rankled: I heard from a motorist who got two $300 citations for being safe, prudent, and reasonable, all thanks to unreasonable use of school bus flashing lights and automated ticketing machines installed on Dallas County Schools‘s buses. I fired off the below letter to my Texas legislators. If you are also concerned, contact your legislators (find them here) and Dallas County Schools (info@dcschools.com). Dallas County Schools has installed automated ticketing machines on its school buses. These machines photograph motorists who pass a stopped school bus that has its red lights flashing. I am aware of motorists getting pointless $300 automated traffic citations, These are due to how Dallas County Schools bus drivers are using their flashing red lights. In this case, school bus drivers are activating their red lights when departing or entering bus occupants are simply walking between a bus and a school. These pedestrians will not cross a road. Last I checked, cars don’t drive on sidewalks or across school lawns, so this use of red light flashers to stop cars on an adjacent road–where departing or entering school bus occupants won’t even go–is an abuse of power and disrespectful to Texas citizens. First, if the law requires bus drivers to use flashing red lights even when it’s pointless, the law should be revised. Drivers should only be permitted to use flashing red lights when students entering or departing the bus are actually going to cross the road that the bus is on. Second, if this is due to Dallas County Schools policy, then this needs to be investigated by the legislature as an unprecedented cash grab. $300 per automated citation is egregious. This is 400% the cost of a statutorily-authorized red light camera ticket. And that begs the point: are automated ticketing machines on school buses even statutorily-authorized? I realize we’re in tough economic times, but it’s egregious for Dallas County Schools to collude with area cities to set up unusually expensive traffic tickets enforced by a statutorily-unauthorized automated ticketing machines, apparently so that they can abuse motorists who, while being on the wrong side of the law, could not have possibly endangered a student: you can’t run over kids that won’t even be in the road! Posted on February 26, 2013 February 26, 2013 Categories Politics, Traffic SafetyLeave a comment on Dallas County Schools bus cameras = profiteering? Sometimes my doctoral research turns up interesting data. Last time it was Texas’s worst speed traps. Note that this is mainly for freeways. Lesson learned? Stay out of the left lane to avoid speeding tickets. 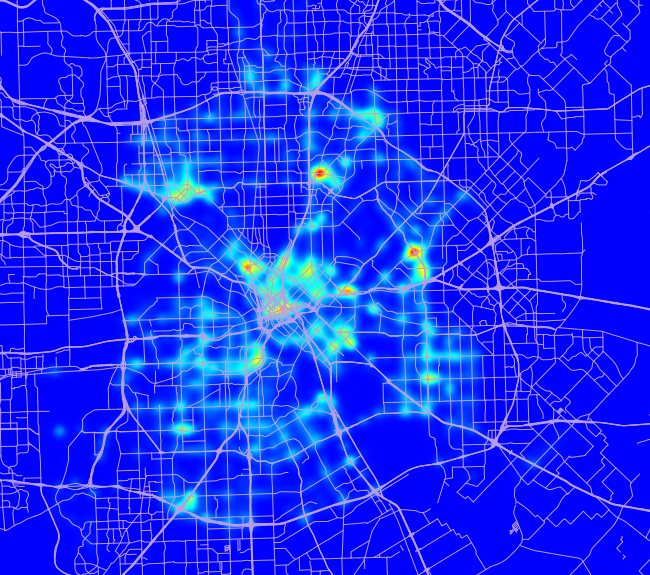 *Constable traffic patrols were disbanded a few years ago, but my dataset includes their activity.